Today the So Suzy Stamps design team is doing a blog hop to feature all the wonderful flower & foliage stamps. There is also a $20 gift certificate being offered to one lucky commenter - must comment on all the blogs - so stay tuned at the end of this post for the entire blog hop list. $20 goes quite a ways in the shop - you could get all the stamps I used on this card during March with the discount. I did all the coloring on the tulip flowers with Chameleon markers. I did the leaves with Copic markers since I don't have any green Chameleon markers. They blend beautifully, however they do take a little getting used to compared to using other alcohol markers. You infuse the marker for a few to several seconds with the blender incorporated into the marker to achieve the variation of colors with one marker. I also added more depth and interest afterwards with colored pencils (I used Prismacolor). This would make a beautiful Mother's Day card too. I didn't have a sentiment from SSS on hand, so I used the Happy Birthday stamp instead. The bowl was first stamped with Versamark using the herb stamp to create a pattern, which created a resist for the Tumbled Glass Distress Ink that I blended on with a blending tool. 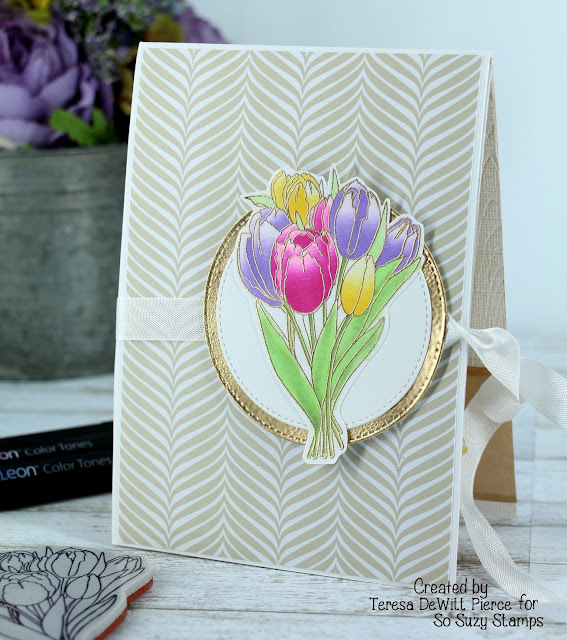 The frame behind the bowl is a die cut (Avery Elle) that was embossed with the same gold embossing powder on every other embossed piece of the project after applying Versamark over the die cut. 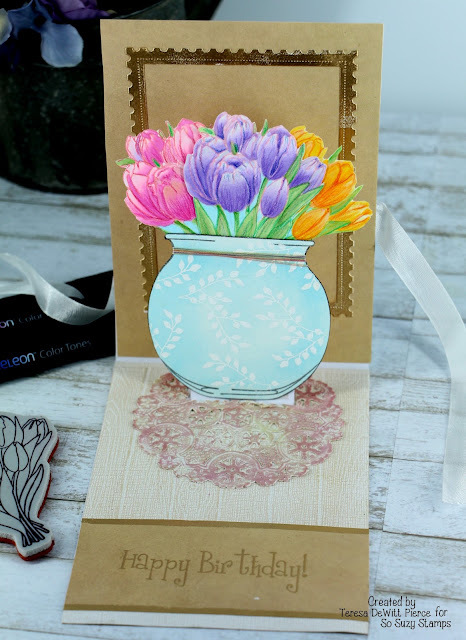 While the star of this card is the tulip bouquet I still say the bowl stamp is one of THE most versatile stamps So Suzy has - I've made several different cards with it. If you want to see those posts they are listed at the end of this post. I still want to make a fish bowl card and a terrarium scene with this stamp. Something to watch for down the road. As you may have noticed the card has a ribbon on it - here is a view of it with the ribbon tied. It was both a design element as well as a way to keep the card closed due to the extra inside dimension. Underneath the bowl is a paper doily that I inked up with a couple of Distress Inks (not the oxide) in Antique Linen and Victorian Velvet. The "floor" - which I envisioned more as a table top - is made from a specialty cardstock - it's the sand-able Core'dinations cardstock in the color picket fence. I embossed it with a planks embossing folder (supplies are listed below) to give it the look of a hardwood table top and sanded the paper with a nail buffer block to expose the darker color underneath. LAST but not LEAST - GIVEAWAY TIME!!!! VIDEO - *please note - I planned to do the entire process on video. My regular video camera was being a pain so I only rescued the part showing how the pop up card base was done. Apologies in advance for the shakiness in portions of the video since the stand was attached to the table I was working on. The pop up is the most challenging part since I am designing this from a vision in my mind and I had to figure it out. I think I learned more about how not to do it (lol). Despite all the tweaking I had to do it turned out very nice in the end. You can also go direct to YouTube to see in HD. Great card! Love these colorful tulips and the pop up is great. 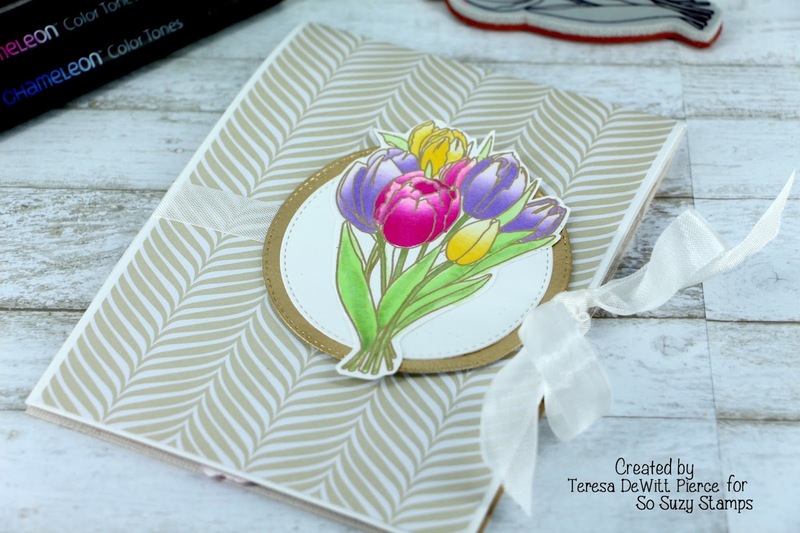 Also enjoyed your video and learning more about how to do a pop up card. Beautiful job! Love your card. The colors and gold are beautiful. Thanks for the video. Oh my oh my I soo love Tulips! I also love the gold that you used for the outlining really adds to everything! Gorgeous pop up card! I love the coloring on those beautiful tulips! Beautiful pop up tulip card. I like the gold circle and frame. Oh my goodness!!! Your card is totally amazing!!! Love, love, love!!! Ariana - I greatly appreciate your sweet comment - thanks for taking a look and glad you love it!